A Prezi 3D presentation is a single very large image with small elements you move around and zoom in and out of. Prezi is having the biggest impact on business presentation tools since Microsoft’s PowerPoint took us from transparencies to computer monitors. The three-year-old company made a splash in 2009 with its Prezi software, and now the company has introduced a new version of its cloud-based software that has an even cooler feature set. Prezi’s original claim to fame was the way in which it allowed a presenter to pan and zoom around a contiguous presentation, versus the serial one-slide-at-a-time productions that conventional programs such a PowerPoint allow. The latest version of Prezi adds two new features: 3D backgrounds and fade-in animations. In a Prezi presentation such as this, you'll first see only the area inside the green circle. Click in that area, and the slide will zoom out reveal the entire scene. When you use a 3D background for your presentation, Prezi creates a parallax motion for the image. 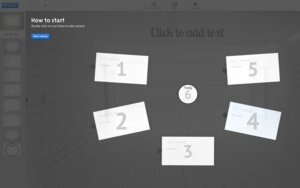 Now when you pan around and zoom into the presentation, the background image adjusts accordingly, as though your text and other presentation elements were floating inside the background. With fade-in animations, you can reveal elements in your presentation slowly by having them fade into the frame, instead of showing the frame with all the elements already in it. Third-party developers are producing 3D backgrounds that can be used for Prezi presentations. Being SaaS (Software as a Service), you produce a Prezi on the company’s website at prezi.com. There is a free version available, dubbed Public, but presentations created using that tool are public--anyone can see them--and they bear the Prezi logo. Business users will want to use one of Prezi’s paid subscriptions, which render your presentations private and allow you to use your own logo. The oddly named Enjoy subscription costs $4.92 per month (or $59 billed annually) comes with 500MB of cloud storage; a Pro subscription costs $13.25 per month (or $159 billed annually) and comes with 2GB of cloud storage, plus a desktop version for creating presentations offline. Group licenses are also available, and there is a version for students and teachers.